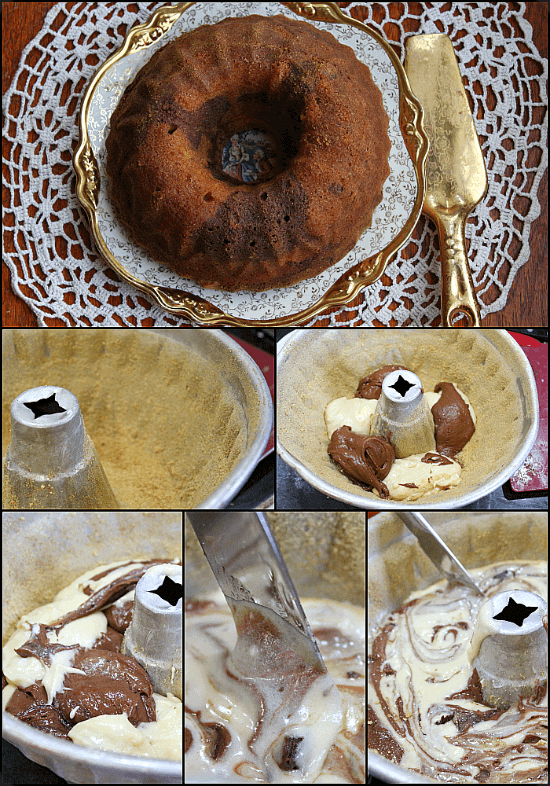 This old fashioned marble pound cake recipe is rich and moist without being too sweet. The vanilla flavor is strong but it is balanced by a dark chocolate swirl that has been flavored with bourbon. 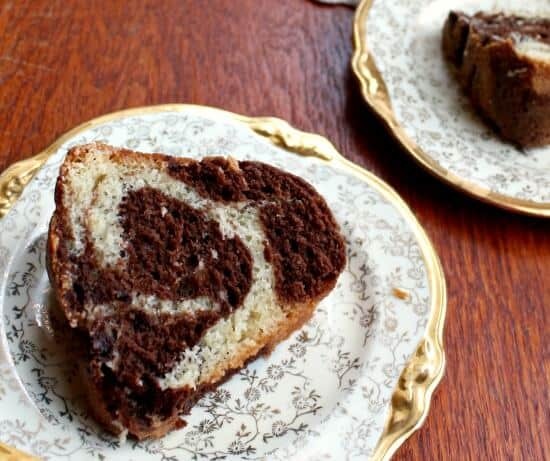 Believe it or not, marble cake is one of the first cakes I ever made — maybe the very first. I made it across the street at my best friend’s house with his and his mom’s help. It was my mom’s birthday and I was just old enough to notice that she never got cakes. We rectified that on that very day. He is now a rather famous artist and probably does not make cakes anymore. I still hear from him once in a blue moon. Anyway. I got about ten thousand cookbooks for Christmas. When you tell my husband you want a cookbook and give him a list to choose from he just buys all of them. Spoiled? Who me? One of the cookbooks was The Beekman 1802 Heirloom Dessert Cookbook I really love it because all of the recipes are arranged in seasons. Not that I would let that make a difference. I live in Texas — I don’t need no stinkin’ seasons. But the pound cake was in the winter section and it just looked too good to pass by. It wasn’t as sweet as I thought it would be but that made it really appealing to me because sometimes I don’t want to serve something super sweet — especially if I am going to be serving ice cream or a sauce, you know? This is just right for a snack in the afternoon with coffee or fancied up with a sauce after a nice dinner. 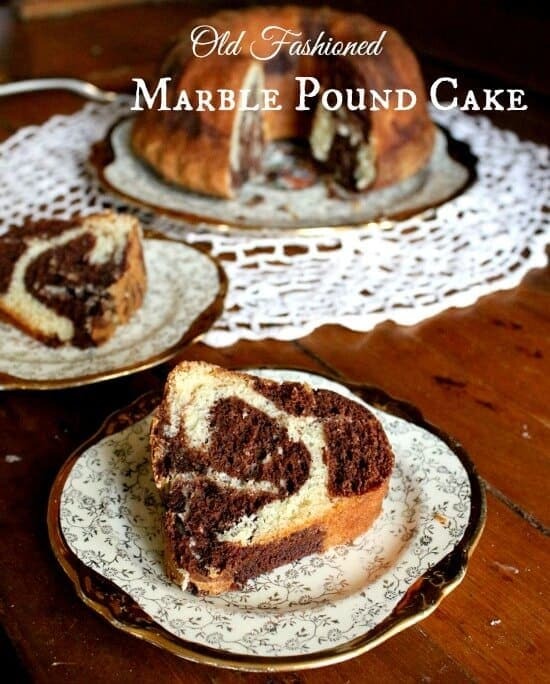 Here’s the recipe for the marble pound cake — it’s so good I know you’ll love it. Still not quite what you are looking for? What about the bourbon pecan pound cake? Moist and not too sweet, this old fashioned marble pound cake recipe is just as good as you remember it. Vanilla cake is brightened with orange while the chocolate swirls are deepend with bourbon -- just a touch. Grease the pan and dust with graham cracker crumbs, shaking out the excess. Whisk together the flour, baking powder, baking soda, and salt -- set aside. Beat the butter and sugar on medium speed about 5 minutes, until very light and fluffy. Add the eggs, one at a time, beating 1 minute after each addition. Remove 1 1/2 cups of the batter to a smaller bowl. Mix in the melted chocolate and bourbon until the color is consistent. Add the orange zest to the remaining vanilla batter, mixing in well. Spoon the batter in the pan, alternating chocolate and vanilla. Swirl a knife through the batter. Bake for 50 minutes to 1 hour, or until a toothpick inserted in center comes out clean. Let cool in the pan for 30s minute. 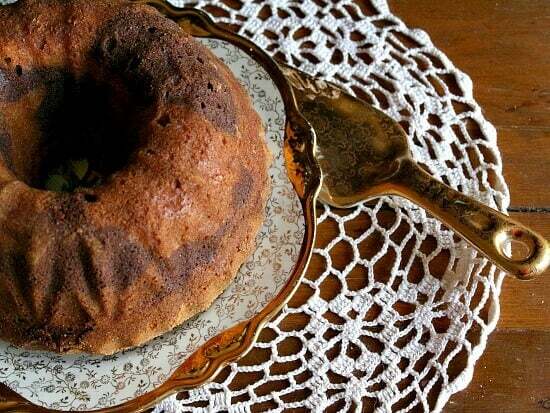 Loosen the cake from the pan and turn out to finish cooling. Will this work for cupcakes?? yes. It’s a little trickier to get the marbling because the cupcakes are smaller but it works fine. Marble cake was also one of the first cakes I made. I was staying at my friend’s house for the weekend, and we whipped one up for some holiday. So fun. This one looks delicious! Thanks Sarah! I’ve always loved marble cake.